As many of you know, Thanos and Asa live in Helsinki, which is where the soul of Ovi magazine also resides. Online, we are an international magazine that reaches almost 100 countries, while outside our front door lays a foreign land called Finland with which we interact on a daily basis. Until now, there has been a severe lack of quality media printed in English that doesn't divide the world into us and them, Finn and foreigner, but today that changes with the launch of FREE!, a new monthly cultural magazine in English. FREE! embodies the spirit of Ovi with its belief in integration and unification, which is why we are proud to promote and support this new project. We invite our fellow citizens of Finland to also support FREE! by picking up a copy from one of their stylish blue stands around Helsinki and spreading the word. Ovi magazine wishes Eduardo Alonso and Antonio Díaz all the best with their brave new venture. Today you will find a new free publication in more than 120 places across the Helsinki area. Yes, one more, but don’t fear it: It has fancy colours and it’s different. FREE! Magazine offers a new look at Finnish culture. But hey, it’s in English. That’s right! There is already a good bunch of immigrants in Finland. Maybe you are even one of them. We are sure many of them miss reading a magazine or a newspaper they can easily understand. However, FREE! is not only for immigrants. Even more than Swedish, English is the second language in Finland. How often do you hear the English language while walking down Esplanadi or shopping in Kamppi? Finns are very exposed to foreign media and the Internet has blurred the language boundaries making English the common ground. Still, the language does not explain why FREE! is different. Our magazine features original in-depth articles and interviews, with the aim of showing the wide array of cultural happenings and products in Finland. If, for some reason or another, we are all stuck in the country, let’s have some fun. It has a lot to offer. FREE! is created in an honest and passionate way. 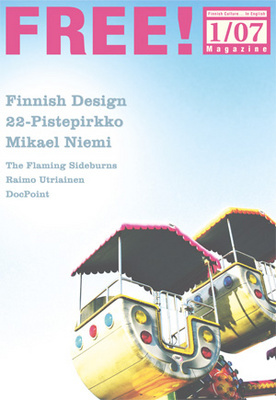 Within the pages of the first issue, you will find author Mikael Niemi talking about his latest book and the Keränen brothers of 22-Pistepirkko pass-by to comment upon their albums and projects. Comic artist Kaisa Leka starts her tour around the world in our pages, while drummer Jay Burnside explains the secrets of the new Flaming Sideburns album; even the Ovi Bad Boys sneak into the FREE! pages. The team of FREE! Magazine has worked more hours than a 7-Eleven to create its high quality content and design. We hope you appreciate it. Visit our website and tell us your feedback. We want FREE! to become a magazine for everyone. - FREE! Magazine and Jolly Dragon invite you to the launch party of FREE! Come and join us this Friday 19.1 (8pm) at Restaurant Olivers (Annankatu 21, Helsinki). Discover our first issue. Subscriptions to our magazine (and drinks) giveaway! "How often do you hear the English language while walking down Esplanadi or shopping in Kamppi?" Well, that's because the tourists hang around in those places. uuuhhh, that's kind of simplistic explanation. i meant the comment, not the article. Do you still think that there are only tourists in the center of Helsinki?